Definition - What does Small Form-Factor Pluggable Transceiver (SFP) mean? A small form-factor pluggable (SFP) transceiver is a compact, hot-swappable, input/output transceiver used in data communication and telecommunications networks. SFP interfaces between communication devices like switches, routers and fiber optic cables, and performs conversions between optical and electrical signals. SFP transceivers support communications standards including synchronous optical networking (SONET)/synchronous digital hierarchy (SDH), gigabit ethernet and fiber channel. They also allow the transport of fast Ethernet and gigabit Ethernet LAN packets over time-division-multiplexing-based WANs, as well as the transmission of E1/T1 streams over packet-switched networks. SFP is also called a mini gigabit interface converter (GBIC) because its function is similar to the GBIC transceiver but with much smaller dimensions. The SFP transceiver is specified by the SFP Transceiver Multisource Agreement (MSA), which was developed and is followed by different transceiver manufacturers. 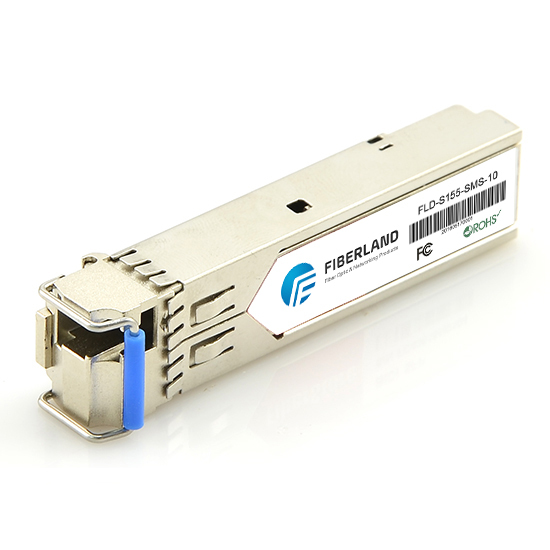 SFP Transceivers have a wide range of detachable interfaces to multimode/single-mode fiber optics, which allows users to select the appropriate transceiver according to the required optical range for the network. SFP transceivers are also available with copper cable interfaces, which allows a host device designed primarily for optical fiber communications to also communicate over unshielded twisted pair networking cables. Modern optical SFP transceivers support digital diagnostics monitoring (DDM) functions, also known as digital optical monitoring (DOM). This feature gives users the ability to monitor the real-time parameters of SFP, such as optical output power, optical input power, temperature, laser-bias current and transceiver supply voltage.